Flux Factory has transformed itself over the course of eighteen years. We’ve changed from an informal living collective to a formal collective that organized cultural “stuff,” to an art-making collective that is also a 501c3 organization, to an international art-making nonprofit and competitive residency program that commissions collaborative projects. In an alternative art space that operates on a shoestring budget, the successes and failures, the innovations and stagnations, the compatibilities and incongruencies take on epic proportions and affect every level of our organization and individual in our collective. When demands outnumber resources, how can we function as a nimble and fluid artist collective that requires consensus-based decision making while also meeting the regulations of our nonprofit structure? As we struggle to answer this question, we realize we’ve drifted into the outermost fringes of institutionalization. For us, Public Trust begins in this state of self-reflection. Inspired by resistance movements and the history of institutional critique, we wanted to investigate the role of money in public organizations, bureaucratic mechanisms, institutionally cultivated sensibilities, and where, exactly, trust falls within this spectrum of questioning. At a moment when accountability motivates so many of our demands, we wanted to organize an exhibition that would hold our own feet to the fire, as curators and as managers of an organization that both requires and serves the public’s trust. We’ve commissioned artists to critique, celebrate, augment, and intervene in the institutions that generate, package, and deliver culture in New York City. 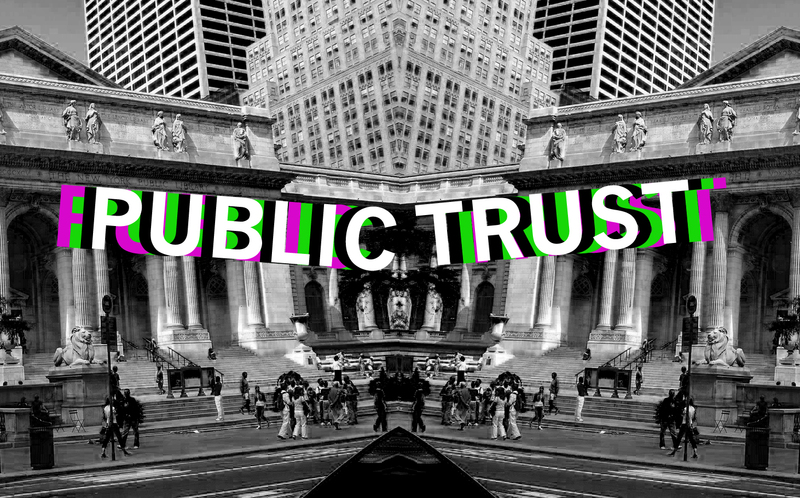 The works included in Public Trust examine intentional and unintentional institutions: museums, NYC’s infinite network of street vendors, sports, banks, political party conventions, libraries, our neighborhood, and of course, ourselves.